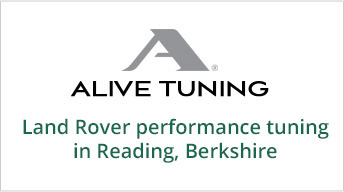 Rovertune Limited has established a long and successful alliance with Alive Tuning, one of the UK’s premier specialists dedicated to enhancing the performance and fuel economy of diesel and some petrol engine Land Rover vehicles. Rovertune Ltd has the specialist software to provide tailor made performance remap tuning to all diesel engine versions of the Defender (including 2.4 Puma 2007-2011MY and 2.2 TDCi 2012MY onwards), Discovery, Discovery Sport Freelander, Range Rover, Range Rover Sport and Range Rover Evoque. Most Land Rover models within this range of vehicles can benefit from being upgraded, including those fitted with the very latest Td4, Sd4, TdV6, SdV6, TdV8 and SdV8 engines. ECU remaps can also be applied to petrol engine versions of the Range Rover Evoque, 3rd Generation Range Rover (L322) and Range Rover Sport fitted with the 4.4L Naturally Aspirated and 4.2L Supercharged engines. The performance remap is not a ‘standard’ remap that is offered by many other suppliers, but is specifically tailored to suit your very own requirements. Whether you desire increased Fuel Efficiency, Maximum Power and Performance, or a balance of both, we can put together a package that suits your needs perfectly. All we need is to ask you a few relative questions relating to your vehicle and driving preferences. Customers can then, if they wish, go on to choose from a range of performance packages suitable for their vehicle, commencing with the remap, then select from a range of performance improvement ‘add-ons’ starting with Performance Filters, then progressing to Performance Intercoolers, EGR Bypass Kits, Sport Silicon Hoses, Sports Exhaust Systems (or Sports Stainless Steel Exhaust Systems as an alternative), Hybrid Turbo and Brake Upgrades etc. It should be noted that not all of the above are suitable for inclusion in every vehicle within the Land Rover range. Rovertune Ltd can advise on the options that are available for any vehicle. There are also other options available, including upgrades to vehicles exterior and interior equipment. All specialist performance enhancers and upgrades are manufactured within the UK (not cheap imports) by specialist companies, most of which are respected as being represented at the highest levels in British Motor Sport. Customers can therefore expect their purchases to be manufactured to the highest quality, provide optimal results, give proven performance and return long term faultless durability. The performance upgrades are continually improved and developed as Land Rover produce new vehicles with ever more sophisticated engines and technology. Prices for the performance upgrades and enhancing packages, including individual items of equipment are shown on the Alive Tuning website, which also contains all technical information as to what customers can expect from their purchase. We would also advise all potential customers to review the Alive Tuning website www.alivetuning.com to establish the various options available to them. Alternatively, contact Alive Tuning direct or speak with us at Rovertune Ltd to obtain relevant information. Rovertune Ltd recommend that all modifications, including the fitting of any accessories, to standard factory delivered vehicles should be notified to your insurance company. Customers should note that before any remapping can be undertaken a check must be carried out to ensure that your vehicle has the very latest Land Rover software updates installed. Rovertune Ltd can do this using the official Land Rover SDD diagnostic systems and there will be a charge of £20.10 + VAT for this operation. Should updates be required there will be an additional charge of £33.50 + VAT to apply the updates and customers will receive an SDD diagnostic print-out to show that software updates were needed. Customers should also be aware that any performance enhancing package, including ECU remapping, may invalidate any manufacturer’s warranty. Regardless of claims by some company’s it is now virtually impossible to improve the fuel economy of vehicles manufactured by Land Rover from 2010MY onwards, as they are fitted with a different type of ECU to those in earlier vehicles and are now factory set for maximum fuel economy. However, it is still possible to achieve substantial increases in power and torque for these later vehicles. For further details regarding the various performance packages and prices, please call us at Rovertune Ltd. on 0118 950 2777 where we will be happy to discuss in more detail your actual upgrade requirements.